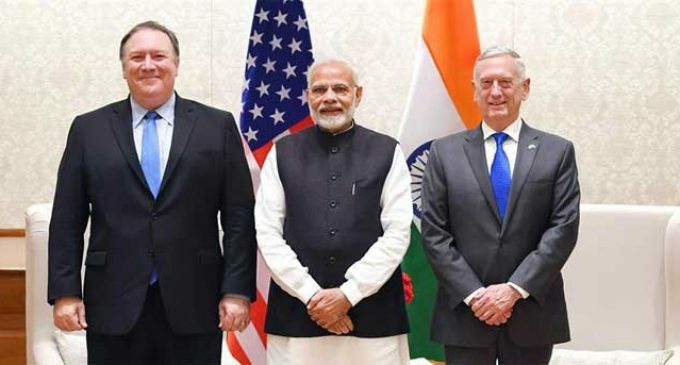 New Delhi, Sep 7 (IANS) US Secretary of State Michael Pompeo and Defence Secretary Jim Mattis called on Prime Minister Narendra Modi on Thursday following the first ever India-US 2+2 Ministerial Dialogue. “They conveyed greetings of (US) President (Donald) Trump to the Prime Minister,” a statement issued by the Prime Minister’s Office (PMO) said. “The Prime Minister fondly recalled his interactions with President Trump and requested Secretaries to convey his greetings to him,” it said. According to the statement, Pompeo and Mattis briefed Modi on the fruitful and productive 2+2 dialogue held earlier in the day. Modi congratulated both the Secretaries and their Indian counterparts, External Affairs Minister Sushma Swaraj and Defence Minister Nirmala Sitharaman for holding of the first 2+2 dialogue. Pompeo and Mattis were accompanied by Sushma Swaraj and Sitharaman when they called on the Prime Minister.